Rumors of a failed lawsuit launched by Crowdstrike, a cybersecurity industry leader, against product-testing firm NSS Labs quickly spread Tuesday among the thousands of attendees at the 2017 RSA conference. During one of the conference’s many industry-promoted parties Monday night, multiple attendees could be overheard talking about the controversy even before media reports began circulating. Other cybersecurity experts questioned NSS Labs’ capabilities, online. NSS Labs subsequently released the results of the product audit Tuesday morning. The free, public version of that information, however, is only available in a limited format. A subscription to NSS Labs’ database service, which can cost upwards of $12,000, is necessary to access the full report. Prices for an NSS Labs subscription vary dependent on the size of the organization and number of users per account. 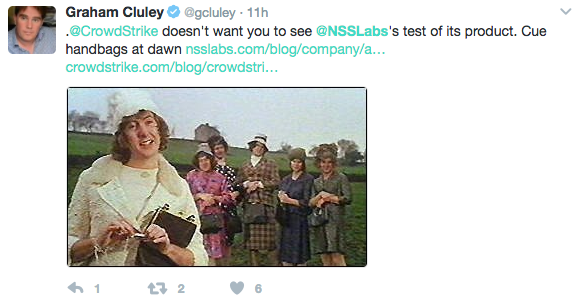 Crowdstrike representatives wrote in a blog post Tuesday that NSS Labs had unlawfully accessed the company’s Falcon software, breached a previously agreed upon audit contract and then performed flawed tests. In April, CrowdStrike entered into a voluntary agreement with NSS Labs to test its own products but that relationship ended shortly after the testing firm produced an allegedly inaccurate review. The aforementioned software reseller is Constellation Software Inc., a publicly traded Canadian company that provides numerous third party software services and products. Though the restraining order and injunction were defeated in court, NSS Labs’ employees are careful to speak about the incident because of the threat of future litigation. Anything said at this point could be used in court, so “they are choosing their words carefully,” a spokesperson said. NSS Labs’ “AEP Group Test” also examined the efficiency of other endpoint products developed by Carbon Black, Comodo, Cylance, Cybereason, ESET, Fortinet, Invincea, Kaspersky, Malwarebytes, McAfee, SentinelOne, Sophos, Symantec and Trend Micro. There are no other legal actions against NSS Labs at this time, a spokesperson told CyberScoop. “CrowdStrike contends that NSS’s report will ‘cast the Falcon tool in a poor light, and a cursory analysis of the two private reports shows that the public report will be inaccurate’ … [causing a potential] decrease [in] sales and revenues,” a summary of the original court case notes. Crowdstrike became one of the most famous brands in the cybersecurity industry last year after securing a contract with the Democratic National Committee.